Edibles have been the talk of the town of late. Market reports continue to emphasize exponential growth in the concentrate and edible categories, and this versatile segment of the industry is capturing consumers’ attention across every demographic. As chefs and extractors grasp just how limitless the creation of cannabis-infused food can be, some are taking things one step further with cannabis you can drink. And even there, the opportunity sprawls from cold brew and kombucha, to ginger ale and honey sticks. Here we’ll look take a closer look at these two different beverage companies, and how they demonstrate that reports like the oversupply of flower in Oregon by no means indicate a dead end for the industry. These days, less than a third of the industry has anything to with joints and bongs. Things are just getting started, and the opportunity is still vast. Aurora Elixirs positions itself as a cocktail mixer, highlighting the “golden hour” of the day and featuring more mature, lightly-carbonated flavors like Lavender Spice and Grapefruit Rosemary. It’s essentially a CBD spritzer, made with natural ingredients, 15 mg of hemp-derived CBD and 8g of sugar. 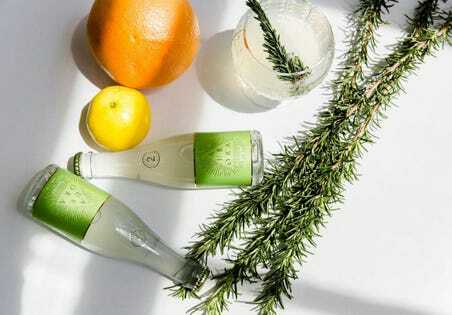 The petite glass bottle has a pry-off, crown cap closure, similar to Fever Tree ginger beer and tonics. The lavender option has a more floral lean, with notes of coriander and the usual layer of calm supplied by the soothing lavender aroma. I drank half at the end of my work day, and within a half hour I felt a significant decrease to all feelings of worry and stress. So significant I really didn’t feel like working anymore. The grapefruit rosemary is more herbal and tart–and would go fabulously with gin, I imagine. A gin drink that would at once soothe and lubricate your brain for more sincere, authentic conversation during happy hour. Müru Syrup is less of a mixer, and more of a versatile sweetener. The way we use sugar to sweeten tea, cocktails, drinking chocolate, oatmeal–like a simple syrup that contains cannabis instead of sugar. I’ve tried Müru in mocktails, martinis, lemonade, darjeeling tea…it works for everything with an extremely efficient few drops. As a recreationally licensed cannabis company in Oregon, any Müru product has lab results to prove the consistency of the cannabis-derived ingredients, whether the THC-infused formula, the all CBD-version, or the 1:1 balanced blend of THC and CBD. The syrup comes in Lemon and Blackberry Lemon flavors, with an additional straight Grape for the THC-infused range. But it’s very light–without the most sophisticated of drinking palates, I still squeezed a few slices of lemon into a batch of cucumber-lemon-Müru water I made one afternoon. With a sugar-free recipe and state-certified lab results for every bottle and every batch, this syrup simultaneously fulfills needs for a low-impact, healthy way to implement cannabis into your day, as well as provides a versatile, water-soluble method of mixing cannabis into a wine spritzer or cocktail. My personal dosage is about a tablespoon of Müru in a single drink, but feel comfortable starting with something closer to a teaspoon if you don’t eat edibles or smoke concentrate very often. Until the past few years, you had a select few methods of consuming cannabis: inhalation or brain-numbing brownies. You also had basically two options of outcome: either barely high or shot into the next solar system. Not only can you customize your high with an extra sip or a few more drops of cannabis-infused beverages, but you can enjoy something that actually tastes good while getting high. Cheers. CannaNews Stream scans the latest cannabis news from around the internet as it happens then posts it here at News.CannaMaps.com.